Published by: David Fickling Books. Official synopsis: "Raphael is a dumpsite boy. He spends his days wading through mountains of steaming trash, sifting it, sorting it, breathing it, sleeping next to it. Then one unlucky-lucky day, Raphael's world turns upside down. A small leather bag falls into his hands. It's a bag of clues. It's a bag of hope. It's a bag that will change everything. Soon Raphael and his friends Gardo and Rat are running for their lives. Wanted by the police, it takes all their quick-thinking, fast-talking to stay ahead. As the net tightens, they uncover a dead man's mission to put right a terrible wrong. 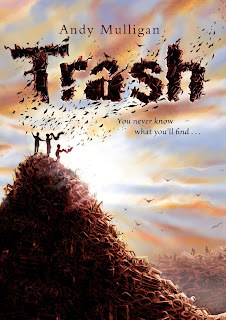 It's three street-boys against the world..."
Trash is one heck of a reading experience. It's only a short book, just over 200 pages in length, but it doesn't half pack an almighty punch or two! I honestly don't know what to say without giving too much away! I really like the format of the story. The majority is told from the point of view of dumpsite boys, Raphael, Gardo and Rat. Then there are bits told by less major characters, such as Father Julliard. One thing that I love about this book, is that you come to love all of the characters (bar the bad guys), even Father Julliard. There's just something about them all, they all just grow on you and you truly begin to care as they are thrust deeper and deeper into danger. You just cannot help but come to care about these three boys as their lives change for ever. There's just something about them - their attitudes, their attributes. What really struck me about this book is the complete contrast to our comfortable lives. Here are boys who know nothing but sifting through rubbish, trying to find products such as paper, pastic and clothes that aren't to spoiled to sell to make a living. They live in shanty's, and do not know the comfort of Western life - clean drinking water, electricity, even a good education. And yet they don't seem to want for any of that. They don't seem to look beyond their life of trash. Andy Mulligan has created something stunning, it's beautifully written, captivating and very entertaining. I love how you never know what is going to happen until it's actually happened - bits and pieces being revealed as the story continues. Each moment has been placed with care on Mulligan's part and makes for a fantastic reading experience. I would be happy to read this book from day to night, every day for a year, two, five even! It's just brilliant! I cannot praise it, or Andy, enough. If you do not go out and buy it now, if even for that beautiful cover (kudos Random House!) then you will regret it, I promise! Thanks to Rosi at Random House for my copy!